If you are looking for one of the world’s widest and most balanced collection of virtual instruments, mix and master processors, amps and effects available for your studio that lets you create, mix and master your music easily and without breaking the bank, look no further. Total Studio 2 MAX is a one-stop-shop for the most demanding, budget-conscious producers, composers and musicians who aim at the best quality without giving up on flexibility and variety. Total Studio 2 MAX includes a whopping 94 products with 43 virtual instruments, 12 guitar and bass effects products and 39 mix and master processors for a total value of just under $9,000 at a unique, unbeatable price. From full orchestral compositions, to electronic music, hip-hop, pop, rock, jazz and more, you have access to a colossal variety of instrumental sounds, high-end mixing and mastering processors as well as the largest number of guitar amps, cabs and effects available anywhere, letting you create massive multitimbral productions quickly and easily as well as finalize an entire project completely in the box. It doesn’t really matter what kind of music you make. 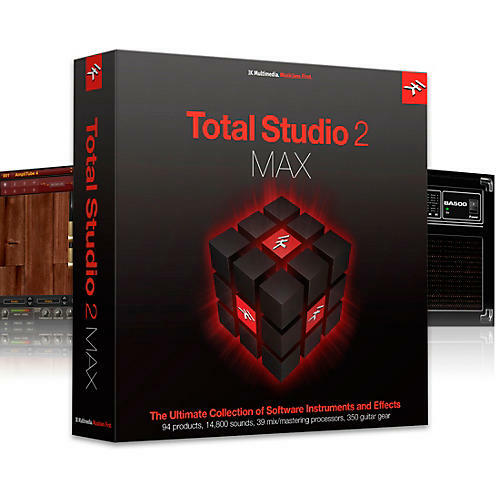 Total Studio 2 MAX has you covered. Whether you are an orchestral music composer for cinema or TV, an electronic or hip-hop producer, a rock guitarist, a DJ, a jazz arranger or a synth artist, inspiration will abound. With its massive 175 GB sample library, everything is in there from IK's world-class Miroslav Philharmonik 2 suite and over 3,000 orchestral sounds and SampleTank MAX, the industry-standard sound and groove workstation, with over 7,000 acoustic instrument sounds. There are also more than 4,000 electronic instrument sounds featuring IK Multimedia's acclaimed legendary synth powerhouse, Syntronik, covering 38 of the most iconic analog and digital synthesizers ever created, the largest selection of bass sounds anywhere including IK's multi-award winning MODO BASS with its 14 physically modeled electric basses and unmatched expressiveness, and much, much more. Plus, the sample-based sounds can be browsed and loaded via the single SampleTank interface. In other words, you have a truly colossal variety of sounds at your fingertips that will inspire you right out of the box, for limitless ideas. Part of the immense Total Studio 2 MAX collection is AmpliTube MAX, the industry-standard tone studio for guitar players, bassists and producers, which includes the finest circuit-modeled digital recreations of the most coveted guitar and bass equipment ever manufactured, coming from legendary names like MESA/Boogie, Fender®, Ampeg, Orange, Fulltone, and many others. With its 214 amps, cabs and mics to its 154 stomp and rack effects, AmpliTube MAX is unmatched as a standalone guitar and bass tone studio for your Mac/PC, and as a channel strip plug-in for your favorite DAW for comprehensive sound manipulation that transcends the guitar world and opens infinite sonic possibilities for treating all kinds of instruments. Who said you have to shed tons of money on analog gear when you can have la crème de la crème of analog modeled processors inside your computer included in the price? That’s right. Not only did we include Lurssen Mastering Console for Mac/PC, which allows you to easily master your project adopting the same workflow and techniques as used by multi Grammy winning mastering engineers Gavin Lurssen and Reuben Cohen, but you also get T-RackS 5 MAX, the world’s most powerful modular mixing and mastering suite ever created with 15 dynamics processors comprising analog and digital compressors and limiters, 12 vintage and modern EQs, and 11 reverb and special processors. T-RackS 5 MAX includes 38 high-end studio processors with exacting digital models of some of the most sought-after analog units ever manufactured and the latest processors in the collection – Master Match, ONE, EQual and Dyna-Mu - plus a complete broadcast-ready metering suite. The processors can be run as individual plugins, as a mix/master chain and within a stand-alone application for full-blown mixes and future-proof masters that will sound great anywhere and will stand the test of time.